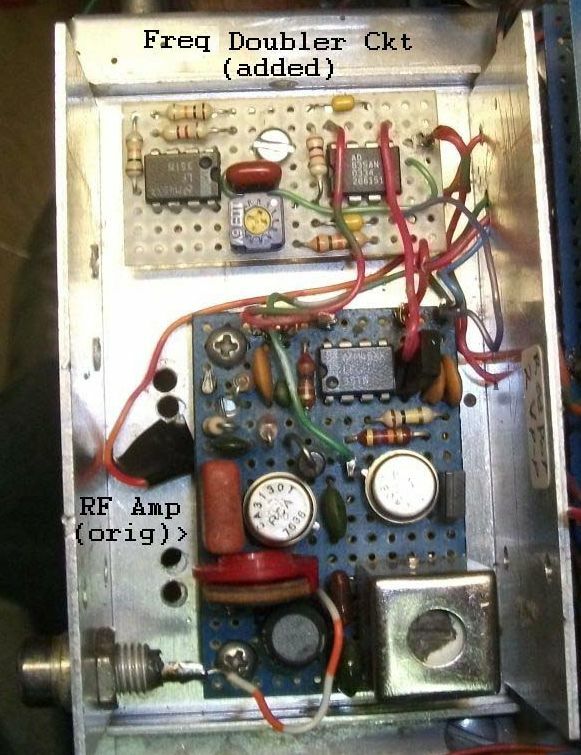 Modification makes homebrew receiver insensitive to WWVB's new biphase-shifted time code. 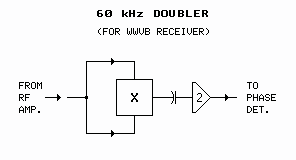 See also below for some thoughts on how to modify some commercial WWVB receivers. Early in the year 2012 WWVB began occasional on-air testing of a new binary phase-shift keyed (BPSK) time code transmitted simultaneously with the original amplitude-modulated code. The new code became a permanent part of the format in late 2012. See: Wikipedia - WWVB. 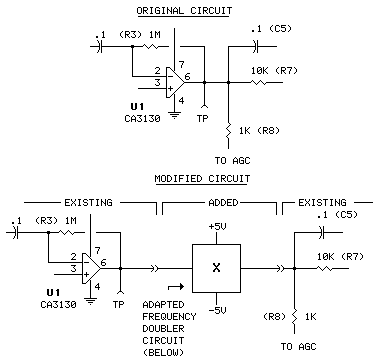 Important Note: The circuit drawing (Fig 1) has changed slightly from the previously published version with the addition of a .1 µF cap and 10k resistor ahead of the AD835 multiplier chip. This restores the signal baseline to zero volts (ground potential). The change does not affect the circuit's function. If you would like to use the circuit in your application, please use this version. Note: BAL (balance) is adjusted for best sinewave output symmetry (LF351, pin 6). If you do not have access to an oscilloscope, eliminate the 10k pot, 15k resistor .1 uF capacitor (*) and 2.7k resistor; ground pin 2. After addition of the doubler circuit the 180° carrier phase shifts (now 360°) are virtually invisible to the receiver's phase detector. The conversion gain (Kφ) of the phase detector is increased somewhat (and thus system loop gain), but it doesn't seem to affect the operation of the overall system much. The receiver now goes a little berserk at the ±45° shifts at minutes 10 and 15, but settles quickly. [It appears the ±45° shift is not included when the BPSK code is being transmitted. Good!] Otherwise the receiver now chugs along as before. [WWVB has tweaked the phase reversals since early testing so as to make the BPSK code even less apparent to the modified receiver.] Decoding of the amplitude-modulated original time data also resumed after the modification. [I have no plans to add biphase time code recovery capability to the receiver, though it would be an interesting exercise.] The modified receiver will continue to be useful as a frequency standard, as it has for the last 30 years. Note 1970's technology / homebrew construction. In response to a couple of queries from readers about the WWVB receiver's RF amplifier and AGC circuit, I've decided to include a schematic of that circuit here in case someone else is interested. Because all of the original documentation has been lost, I had to back-engineer the thing a little in order obtain enough information to allow installation of the frequency doubler circuit described above. The RF amplifier/AGC circuit appears below. 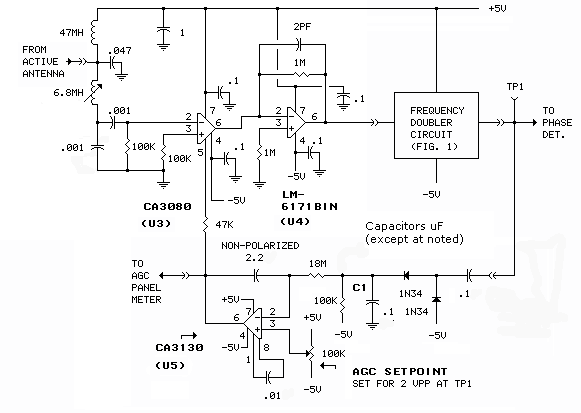 The key to the circuit's operation is U3, a CA3080 transconductance amplifier. Combined with U4, LM6171 opamp, the pair provides something like -20 to +60 dB of variable (current-controlled) gain. U3 is not a voltage amplifier; it must be combined with the LM6171 (or similar fairly high-speed opamp) to provide voltage gain. The gain of the pair is controlled by U5, the AGC amplifier. 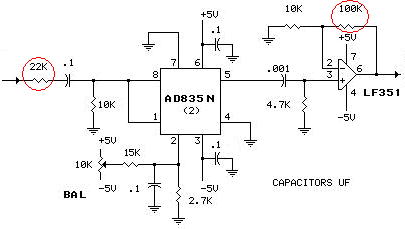 A more-positive output from the AGC amp drives more current into pin 5 of the CA3080, generating more gain in the CA3080/LM6171 pair. The circuit originally had an LM318 in the U4 spot. The LM6171 is less fussy than the 318. The tuned input circuit (6.8mH inductor, 001µF capacitor), along with a similar circuit in the active antenna, provides only modest selectivity at 60 kHz. 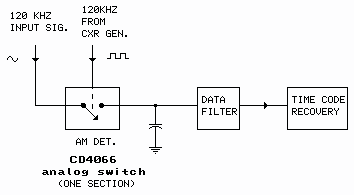 The receiver's extremely narrow bandwidth (<1Hz) is provided by the loop filter downstream. The two 1N34 diodes, along with the .1 uF capacitors and 100k resistor, form an envelope detector. The rectified input signal voltage appears on C1. This voltage is amplified by U5, the output of which controls the gain of U3 through the 47k resistor. The response time of the AGC amplifier is very slow - the circuit acts as an averaging detector, even with WWVB's very slow modulation. That long time constant makes the AGC circuit (almost) impervious to short noise spikes. Addendum 2: And the Rest of the Receiver?? Unfortunately, back-engineering the front end did not include the balance of the receiver downstream from the RF amplifier/frequency doubler. The general layout is shown below. The phase detector in the receiver is a sampling type and operates in linear mode - unsaturated. That type detector, combined with the AGC-controlled front end, is less susceptible to random noise and signal amplitude variations. 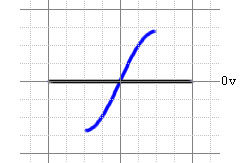 As the input signal gets noisier, ie, the signal amplitude decreases relative to noise, the detector's conversion gain goes down and loop bandwidth automatically narrows. The shots below show the operation of the phase detector. The system is locked to the incoming signal as shown. 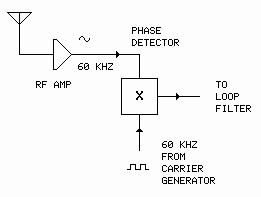 The detector converts the phase of the incoming signal - relative to the locally-generated carrier - to a voltage. I don't remember specifics on the loop filter, except that I used Howard M. Berlin's Design of Phase-Locked Loops with Experiments (H.W. Sams, 1978) as a design guide. The filter is a damped low-pass type - strictly analog, consisting of resistors, capacitors and an opamp or two. It's a "two-speed" affair. It comes up in 'wide' mode for quick lock, then switches to narrow when lock is achieved. At such time as loss of lock is detected, it switches back to wide. [The loss of lock situation will occur when WWVB occasionally goes off air.] The loss-of-lock indication, OR'd with a complimentary loss-of-signal indication from the receiver's synchronous amplitude detector (part of the time-code recovery part of the receiver), lights an indicator LED on the front panel and issues a TTL-level "loss-of-carrier" signal through a connector on the rear panel. 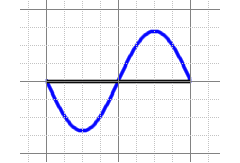 The DC output of the loop filter is compared to zero reference (ground) and the difference voltage is highly amplified. The loop filter/amplifier output voltage varies the frequency of VCXO. The system operates isochronously: The frequency of the VCXO/carrier generator is driven by the loop amplifier so as to produce zero net volts on the sampling capacitor at the output of the phase detector (zero net phase error). The VCXO is a simple TTL-based crystal oscillator (from Poly Paks - anybody remember Poly Paks?) with a varactor diode added across one of the frequency trimming capacitors. That thing has exhibited remarkably little long term drift over the years - I may have re-adjusted it twice in 30 years. It does exhibit some variation due to changes in ambient temperature, but being in a disciplined environment (in the loop), it matters little. The carrier generator is made up with CMOS counters and CD4046 phase-locked loop ICs, the exact details of which have faded from memory. Back engineering that part of the receiver would require a major tear-down and, barring a failure which would require going in to affect repairs, probably won't happen. The front panel also includes lots of other lights, switches and meters (phase error, correction voltage, AGC), including a display of the shift register that receives the time code. For a photo click one of the links below. In principle, yes. It would require a study of the receiver's circuitry to determine where to install the doubler (Figure 1). 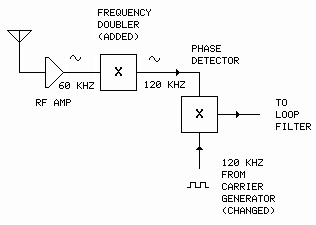 A tougher issue would be reconfiguring the local carrier generator to produce 120 kHz. It might be simple; it might not be so simple. Without the receiver's circuit schematic/service manual, it would require back-engineering. I'm not familiar with the receiver, but it's unfortunate that what looks like a fine old piece of gear suddenly becomes a boat anchor. Don't toss it out though. You never know. Someone might figure out a modification. Some time ago someone sent me a copy of the service manual for a Spectracom 8163 WWVB Receiver/Comparator (PDF). After receiving John's inquiry I dug it out and had a look. It appears that modifying the 8163 would be relatively easy using TWO of the Figure 1 frequency doublers. I have never laid eyes on the 8163 and have no idea if the 599 circuit is anything like the 8163 circuit, but the information below might be useful. 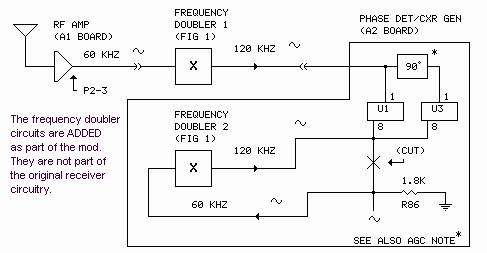 The frequency doubler circuit has changed slightly since it was first published. A .1 µF cap and 10k resistor have been added ahead of the AD835 multiplier chip. This restores the signal baseline to zero volts (ground potential). Please use the current version (Figure 1 above). Install the local carrier doubler (#2) within the A2 shielded enclosure to prevent possible feedback (to the antenna). Adjust the BAL controls on the frequency doublers for best sinewave output symmetry (pin 6 of the LF351). Replace C14 (4700 pF) on the A2 board with a 2200 pF capacitor. Replace C15 (4700 pF) on the A2 board with a 2200 pF capacitor. These changes reestablish the 90° phase-shift needed for proper operation of the AM detector and should bring the receiver back to life. Thanks for your material on WWVB. Inspired by this, I modified my Spectracom 8161 successfully. I tried out with good results the MC1496 and the AD633 as frequency doublers. I modified the reference tripler to work from 40khz to 120khz. Anyways, the unit is working properly and it appears to function as well as it before the WWVB change. The TCODE also works as expected. I may use a small uC tu re- insert the hourly phase markers as I use a chart recorder for phase tracking. From the maintenance manual for the Truetime 60-DC (PDF) that John W sent, I came up with some guidance that might be useful to those wanting to modify this receiver. As with other WWVB receivers, the modification is in two parts: adding the Fig 1 doubler circuit to the RF section and "reprogramming" the local carrier source. Adapted from Figure 1. Changes are circled in red. A 22k resistor has been added to the AD835 input circuit. 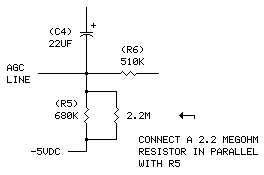 The value of the resistor connecting pin 6 and pin 2 of the LF351 has been changed to 100k. BAL (balance) should be adjusted for best sinewave output symmetry (LF351, pin 6). Part of the frequency doubler mod. Note: The AGC modification may not apply in all situations. Read the comment below. 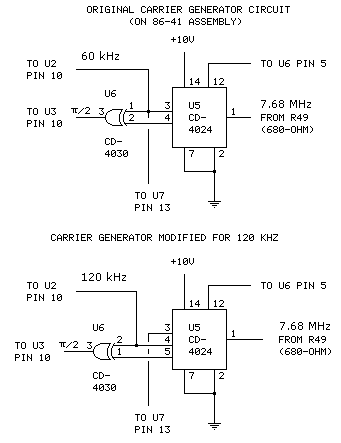 On the carrier generation side, the changes involve U5 and U6 on the analog board (86-41) as shown below. 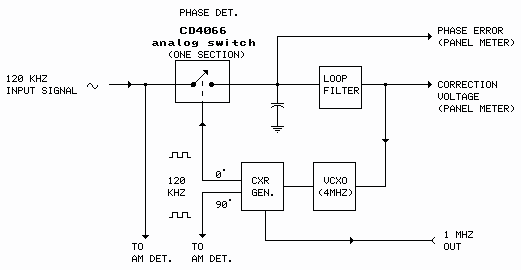 The modification basically changes the division ratio of the CD4024 ripple counter from 128 to 64. The reference crystal runs at 7.68 MHz. Dividing that by 128 results in 60 kHz. Dividing by 64 produces 120 kHz. The XOR gate (U6) generates the required 90-degree phase shift for the phase detector U3. The carriers delivered to U2 and U3 are square waves. The photos in the manual PDF are too garbled to give much guidance on where the components are located on the 86-41 board, but it should be possible to find them by their part numbers and reference designations. Positive and negative 5 volts to power the doubler circuit can be found on J1 D (+) and J1 F (-) on the power supply board (86-52). The 79L05 negative 5V regulator may have to be replaced with a 7905 unit to handle the slightly increased -5V load (but I doubt it). I suscpect you would have been OK simply clipping out the 2.2 meg resistor, but hey, you can't knock success! Glad you were able to get your 60-DC up and running, and thanks for your feedback. You've passed on some very useful information! uses a stepper motor to accumulate phase-slip data. a computer in place of (or in addition to) the stepper motor. The second article in this series. not up to "time nut" standards (by 5-6 decimal places) but still a bit nutty.